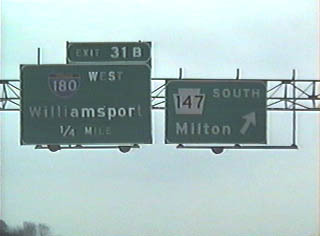 Interstate 180 spurs north from I-80 and Pennsylvania 147 near the borough of Milton to Williamsport and the Lycoming Valley. The rural freeway mirrors the course of the Susquehanna River West Branch north from McEwensville to Muncy. Turning west ahead of Lycoming Mall, I-180 travels around the borough of Montoursville by Williamsport Regional Airport (IPT) to Downtown Williamsport. U.S. 220 overlaps with Interstate 180 from Montoursville west to Williamsport and the Susquehanna Beltway. U.S. 15 accompanies I-180 between the Market Street Bridge to South Williamsport and the west end at Lycoming Creek. 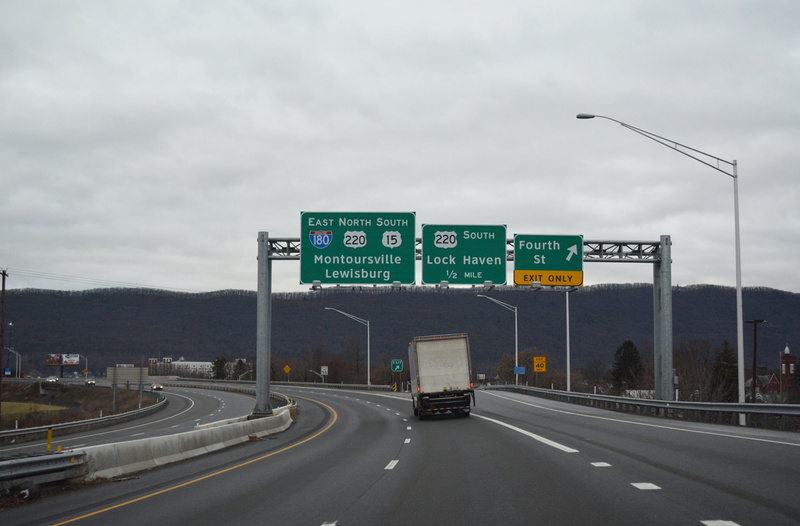 U.S. 220 west to Lock Haven and I-80, and U.S. 15 north to the New York state line, are both a part of the future Interstate 99 corridor. The exchange joining I-80 with I-180 in Turbot Township was originally numbered Exits 31A/B. Vidcap taken 12/17/93. Susquehanna Trail angles southwest along a portion of old PA 147 from the borough of McEwensville to meet Interstate 180 three quarters of a mile north of I-80. Photo taken 01/18/17. Prior to construction of Interstate 180, Pennsylvania 147 extended south from McEwensville to a diamond interchange with I-80. The exchange was eventually incorporated into I-180 with loop ramps added in all directions. Photo taken 01/18/17. 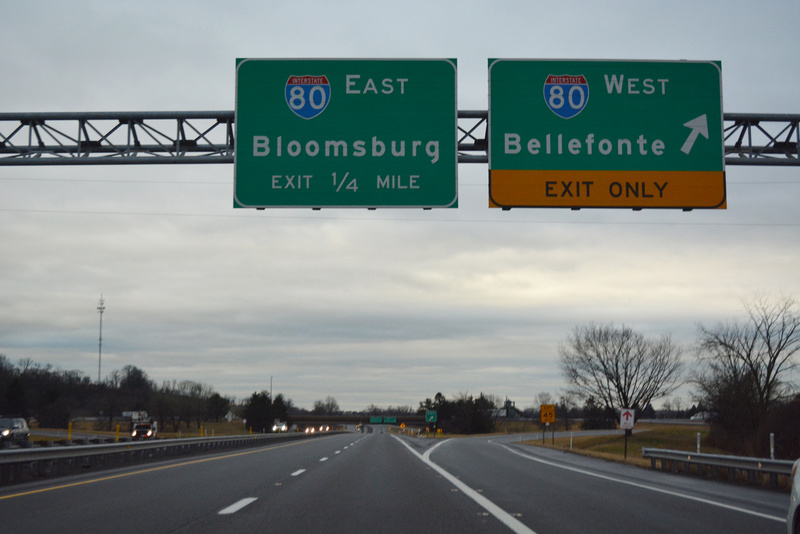 Ramps for I-80 west to Bellefonte and east to Bloomsburg are unnumbered along Interstate 180. I-80 spans the Susquehanna River to the immediate west into Union County. Youngstown, Ohio lies 220 miles away. Photo taken 01/18/17. Interstate 80 trends southeast from I-180 to cross Limestone Ridge into Liberty township. The freeway proceeds east from Mooresburg through Frosty Valley to the town of Bloomsburg. Photo taken 01/18/17. 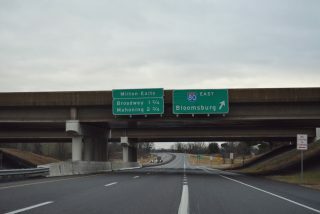 Pennsylvania 147 northbound bypasses the borough of Milton along a freeway leading north directly into the exchange joining I-80 and I-180. Photo taken 05/07/05. 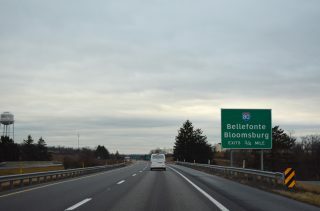 PA 147 previously expanded from a two-lane expressway to a four lane freeway just ahead of the cloverleaf interchange with Interstate 80. 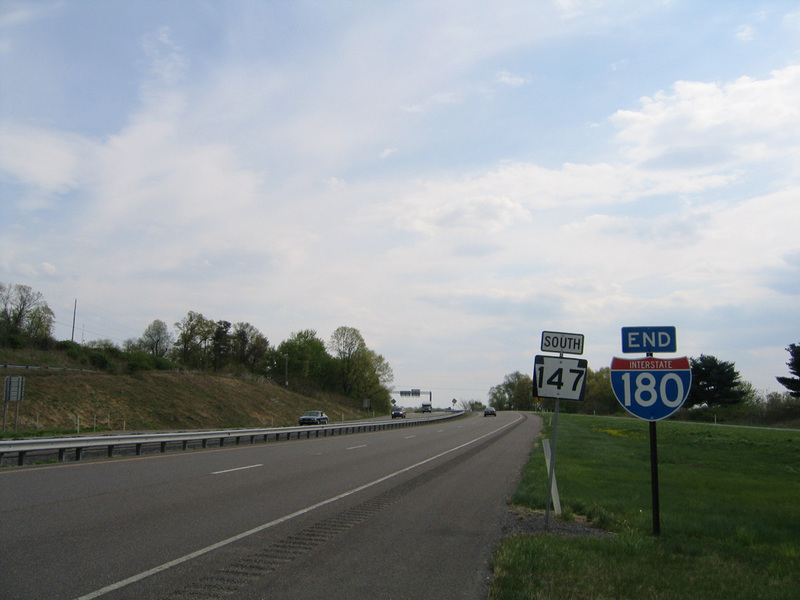 I-80 was rebuilt between U.S. 15 and PA 147/I-180 in 2000-02. Photo taken 05/07/05. Interstate 80 leads east from PA 147 and I-180 to Bloomsburg, Hazelton and the Pocono Mountains. Photo taken 05/07/05. Pennsylvania 147 north concludes as I-180 begins below the Interstate 80 center line. 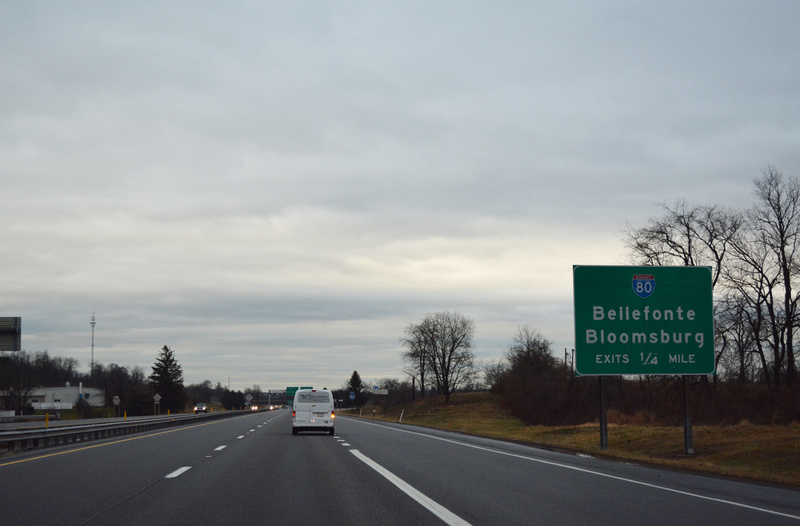 The state route historically extended 26 miles north into Williamsport. Photo taken 05/07/05. 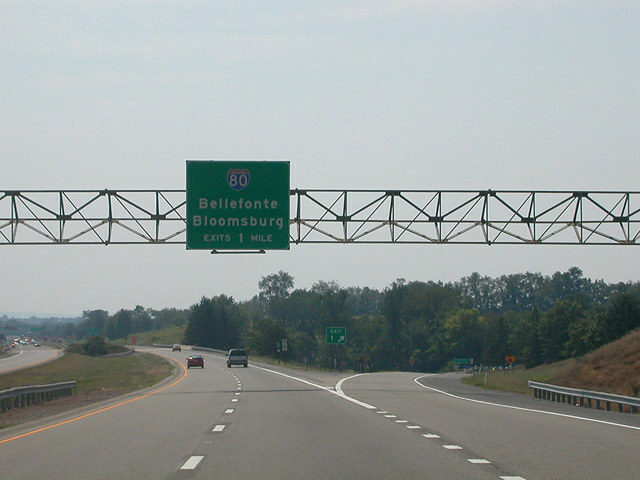 Interstate 80 advances 1.5 miles east from the cloverleaf interchange with the U.S. 15 freeway at New Columbia to PA 147 south and I-180 north (Exit 212). Photo taken 05/07/05. 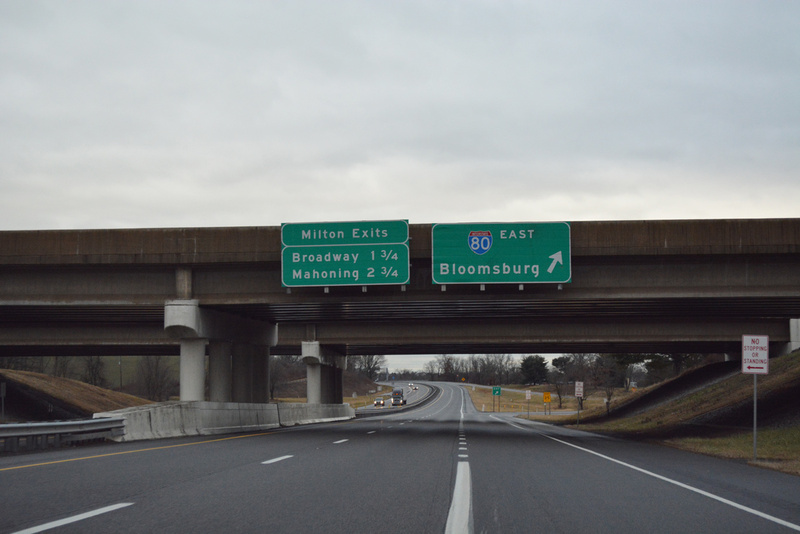 An auxiliary lane opens along Interstate 80 eastbound across the Susquehanna River West Branch to Exit 212A for PA 147 south to Milton and Exit 212B for I-180 west to Williamsport. Photo taken 05/07/05. 2000-02 reconstruction of I-80 expanded the freeway with c/d lanes through the cloverleaf interchange with Interstate 180 west and Pennsylvania 147 south. Photo taken 05/07/05. 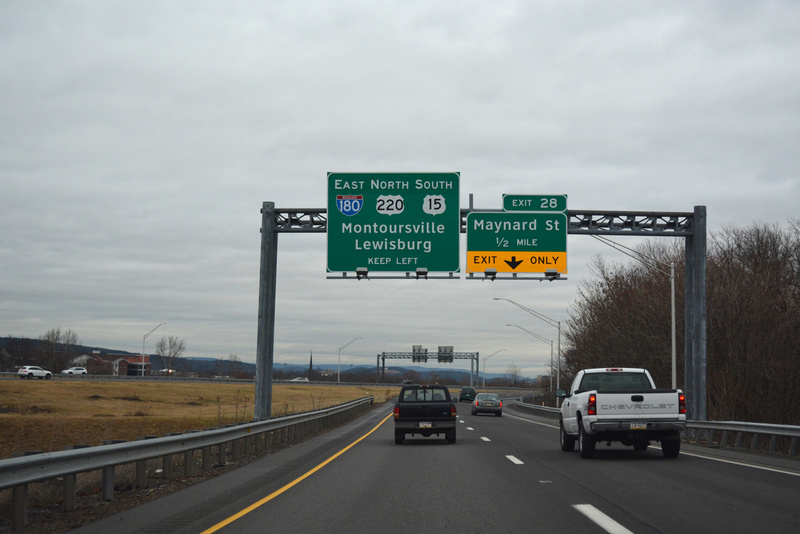 Exit 212B (former Exit 212W) loops onto I-180 leading north to Muncy and west to Montoursville and Williamsport. Photo taken 05/07/05. Interstate 80 heads three miles northwest from PA 254 through Turbot township to meet I-180 and PA 147. Photo taken 09/01/05. One mile ahead of the c/d lane for I-180 west 26 miles to Williamsport and PA 147 south to nearby Milton. Photo taken 09/01/05. 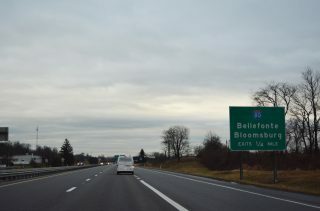 The I-80 roadways separate leading into the cloverleaf interchange (Exits 212B/A) with Interstate 180 and Pennsylvania 147. Photo taken 09/01/05. 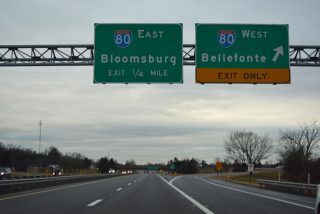 Westbound I-80 reaches Exit 212B for Interstate 180 west to Williamsport and U.S. 15 north to I-99 and the Southern Tier of New York. Photo taken 09/01/05. First photo taken by Tim Reichard (08/11/02); second photo taken 05/07/05. Interstate 180 begins at the trumpet interchange (Exit 29) joining U.S. 220 with U.S. 15 north to Mansfield. 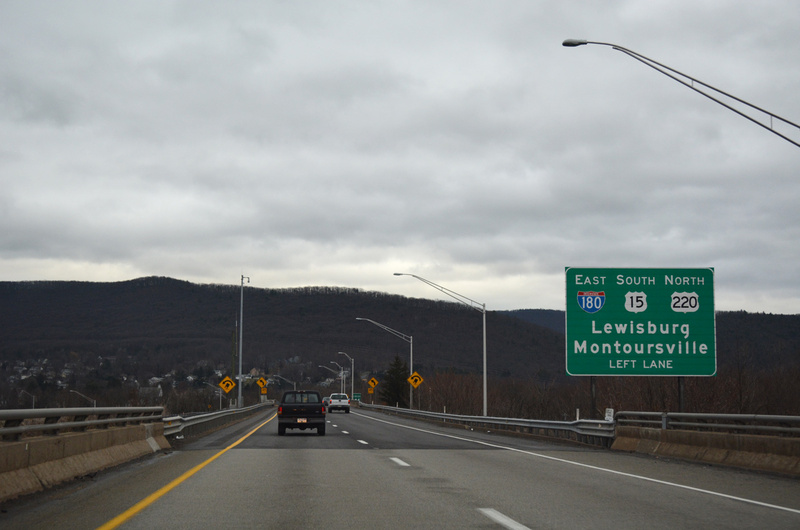 I-180 accompanies U.S. 15 south & 220 east to Downtown Williamsport. Photo taken 05/07/05. The entrance ramp from U.S. 15 south adds an auxliary lane along Interstate 180 east to Exit 28 with Maynard Street. 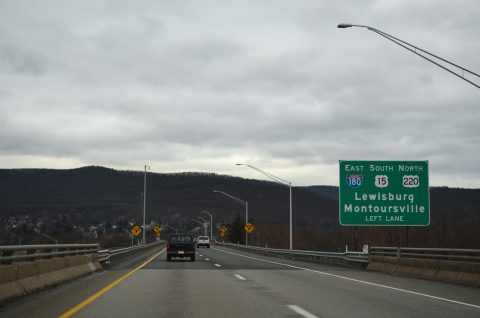 I-180 & U.S. U.S. 15/220 proceed eastward from Williamsport to Montoursville. Montoursville was where TWA Flight 800 bound for Paris, France crashed on July 17, 1996. Of the 230 killed, 16 were from Montoursville. Photo taken by Tim Reichard (08/03/02). Interstate 180 concludes one mile west of the diamond interchange (Exit 28) joining the freeway with Maynard Street and the Pennsylvania College of Technology. Photo taken 05/07/05. U.S. 15 turns north from I-180 and U.S. 220 (Susquehanna Beltway) along the future Interstate 99 freeway 47 miles to Mansfield. Photo taken 05/07/05. 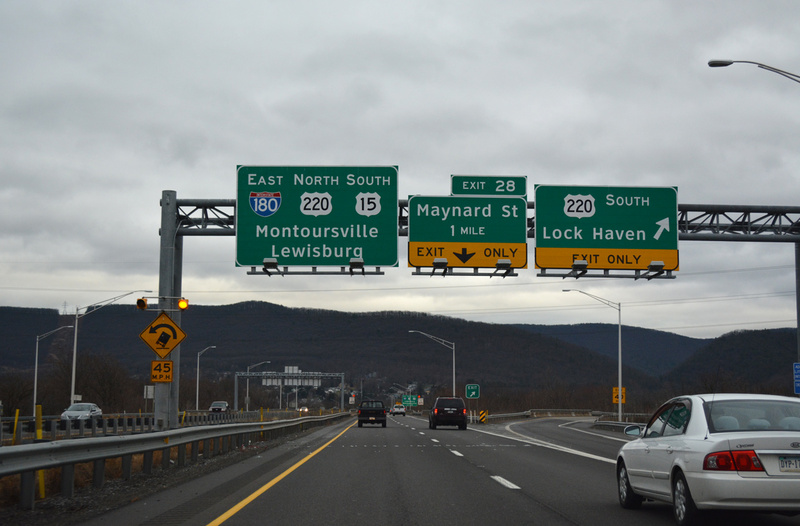 U.S. 220 overlays the Future I-99 corridor 23 miles west to Lock Haven and 31 miles to Interstate 80 south of Mill Hall. Photo taken 05/07/05. An I-180 end shield stands ahead of the U.S. 220 bridge spanning Lycoming Creek. The freeway for U.S. 220 continues another 3.9 miles toward Linden. Photo taken 05/07/05. U.S. 15 runs along side Lycoming Creek south from the Garden View community in Old Lycoming township to enter Williamsport at 4th Street (old U.S. 220). I-180 commences along side U.S. 15 south at forthcoming U.S. 220 (Susquehanna Beltway). Photo taken 01/18/17. The ramp for U.S. 220 (Susquehanna Beltway) south to Lock Haven and I-99 to State College parts ways with U.S. 15 south just ahead of the bridge across Lycoming Creek and connection with I-180. Photo taken 01/18/17. Two lanes continue south from a 1974-built bridge across Lycoming Creek directly onto I-180 east & U.S. 220 southbound. Photo taken 01/18/17. Traffic from U.S. 15 south merges with I-180 and U.S. 220 (Susquehanna Beltway) just ahead of Exit 28 with Maynard Street. Photo taken 01/18/17.